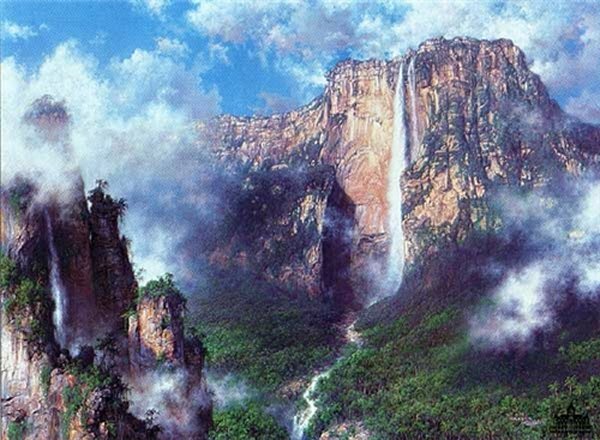 A Lost World - Angel Fall by Larry Dyke ~ The artist traveled to South America before composing this painting. The composition was difficult because of the necessity to show the height of this, the highest waterfall in the world. Often artists utilize animals or humans to show relative size, but that proved to be impossible in this case as a person standing at the bottom of the falls would be so small as to be invisible. He overcame the problem by inserting the cliffs on the left side to show relative size of trees and give the viewer a sense of distance.